In addition to writing music, Christopher has also studied low brass instruments since 2001. 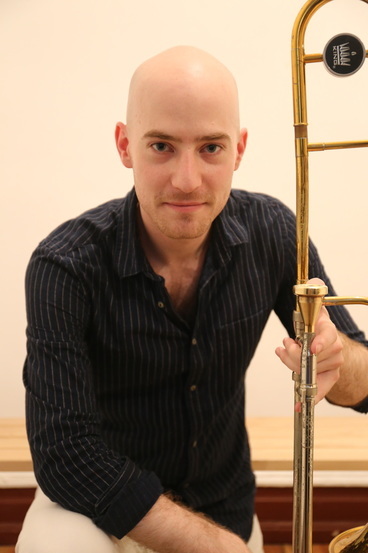 He previously taught private low brass lessons to grade school students at King Philip Regional High School in Wrentham, MA and William H. Prescott Middle School in Brooklyn, NY and currently teaches privately on his own. He is currently performing with Tetsuro Hoshi's band "THE DOGGY CATS". Christopher Palmer is a film/game composer who grew up in Plainville MA, and is now living in New York City. He studied at Berklee College of Music in Boston where he received a Bachelor's degree in Music for Film Scoring and minored in Video Game Scoring. Christopher's most recent projects include working with Game Designer Andrew Heymann on Battle of the Boros, working with Cake Golem Productions as composer for their Basic Adventuring 101 web series, scoring the original themes for the podcast Tele Buddies, and collaborating with game designer Roman Kalinovski on interactive media and game projects. Christopher took part in the Ludum Dare 33 Game Jam as composer and sound designer for Boom!Boom!Emoji, and has been the musical director for Andrew Rothkin's White Rabbit Productions theatrical events.